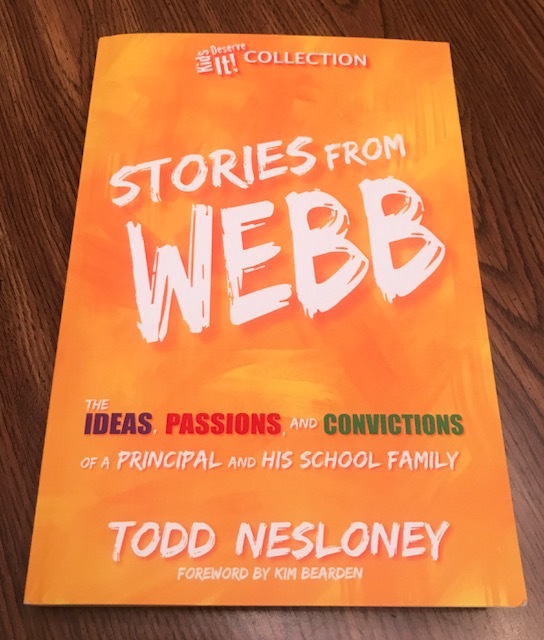 After meeting Todd Nesloney at NCTE’s annual convention last fall, I knew I wanted to read Stories From Webb: The Ideas, Passions, and Convictions of a Principal and His School Family. The guy is amazing! He’s high-energy, willing to speak about his educational beliefs — and listen to yours, and he’s a principal! How many principals do you know that have that much passion for teaching and learning? Well, honestly I can think of 6 or 7, but that’s the cream of the crop, and I’ve been lucky in my teaching career to work with awesome principals. Todd Nesloney shares his “why” story in Chapter 1, and highlights stories of three teachers from his school who remember their “whys.” In each chapter — 1 through 35 — Todd introduces a theme and has a group of teachers and other staff members from his school tell their stories. His wife even has a story: “When You Marry Into Education.” Each story made me nod my head, think, and question my own teaching practices over the 21 years I have been an educator. Each chapter leaves the reader inspired. The Twist: After nodding, thinking, and questioning, Todd asks you to tell your own story. Yes. He leaves “Things to Consider” at the end of each chapter, and asks you to tweet your story to #KidsDeserveIt. That is such a cool thing — for an author to want to hear from the reader. I made some notes. I haven’t tweeted yet, but I will. As I posted on Facebook today: “Get this book. Read it. Renew your love for teaching.” #KidsDeserveIt. And so do you.